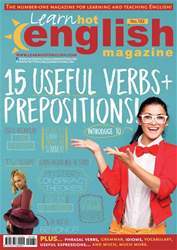 Digital Subscriptions > Learn Hot English > 182 > 15 USEFUL VERBS + PREPOSITIONS! There are lots of useful expressions in English that consist of a verb + a preposition. You probably already know a few of them: wait for, ask for, think about, talk about, listen to… Here are some more really useful ones for you to learn. Choose the correct prepositions to complete the sentences. 1. I forgot all to / about the concert. 2. She was complaining about / with the mess. 3. We’d like to discuss it for / with you. 4. They don’t approve of / by our behaviour. 5. I can’t say I agree with / at your analysis of the situation. 6. This alarm system will protect your home in / from burglars. 7. The cat died of / at old age.